With the recent release of Magic Origins and preparations for attending my first Pro Tour in Vancouver, Modern has unfortunately taken a backseat to Standard testing for me recently. 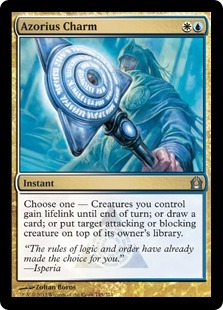 This pains me greatly, as moving from the extremely mana-efficient, decision intensive, role-switching matches of Grixis Control in favor of clunky, barbaric Abzan Midrange is similar to trading in a surgeon’s scalpel for a spiked club; it can get the job done, but it will sure be messy. After the Pro Tour, I fully intend to return to streaming and playing Modern full-time, but for now I intend to hold my Modern analysis until I am able to focus my full attention and deliver content and opinions that I know are of quality (or close to it). With that said, I asked readers at the end of my previous article and viewers of my stream for questions, so let’s get to the mailbag! Goblins has popped up here and there in Modern but has never been a real player in the format for as long as I can remember. The incentives to play Goblins over the much stronger Burn (in my mind) are the ability to capitalize on the various tribal synergies present, and the positional advantage gained by playing a deck much more interested in resilient ground attackers that add up damage over time, rather than “one and done” spells hoping to count to 20. In a format full of Feed the Clan or Leyline of Sanctity, for example, Goblins would be a strong alternative to Burn that does similar things (punch face) but attacks from a different angle. Revisiting Goblins can happen, but to do so we need to analyze what is changing in the format. Currently, this includes the introduction of Goblin Piledriver, and basic metagame shifts as a result of new cards, updated decks and event results. Unless Day’s Undoing pans out, the format doesn’t seem like it will shake up that much with the introduction of Magic Origins. For Goblins to “become a thing” it will have to be because of Goblin Piledriver. Evaluating Piledriver is relatively straightforward; it seems to be on-par power level wise with other tribal Goblins (Goblin Rabblemaster, Mogg War Marshal) yet significantly below the upper tier two-drops (Tarmogoyf, Snapcaster Mage). Protection from blue initially seems irrelevant outside of the Fish matchup, but it does make it immune to Snapcaster, Vendilion Clique, Deceiver Exarch, Electrolyze, Vapor Snag and the bounce mode on Cryptic Command. The lack of haste is important, and should be considered when deckbuilding. I played with this deck for a few weeks, and Azorius Charm did function as a suitable replacement that was able to work alongside Mana Leak, instead of against it. The fact that this particular build eventually died down and never really caught on leaves me inclined to believe that individual power level is often more important than synergy, but the other side could still be argued as well. For those interested, you can find Chapin’s excellent, previously premium article on this deck (one of my all-time favorites) here. The answer to this question is due more to the state of Modern and the deck you are playing with/decks you expect to face than anything else. In my mind, a classic example of this when deckbuilding is Stony Silence vs. Izzet Staticaster in the UWR sideboard. Stony Silence has a few applications (mainly Affinity, and to a lesser extent Tron and the pretty much extinct UB Tezzeret deck) but is insanely good at what it does. On the other hand, Izzet Staticaster has very broad applications against most decks (mana creatures, Affinity, Infect, BW Tokens, Lingering Souls, Dark Confidant, half the Merfolk deck), but is rarely “lights out” when cast. Modern as a format exists in this weird environment where there are too many decks to prepare for everything, but most decks are very powerful and demand sideboard trumps. One strategy when constructing sideboards is to find the most applicable cards for the widest variety of matchups so you can improve against everything. The other end of the spectrum involves picking the worst four-five matchups, and playing multiple copies of the card/cards that best fight that specific strategy. Of course, you can always incorporate a mixture of both strategies, which is why we often see Stony Silence in almost every deck capable of casting it, as it is an extremely strong answer to Affinity, one of the best and most polarizing decks in Modern. Stony Silence can appear in sideboards as a one of in decks with lots of selection like UWR Control, or as a four-of in decks that need it in their opening seven (Suicide Zoo). The correct answer to the original question is, unfortunately, “it depends”, but the factors that it depends on are clear and relatively simple to evaluate. Modern is a format of matchups and percentages. Decide for yourself if it’s worth a large amount of percentage in one matchup to gain percentage across the board. I don’t think Modern received much love from Magic Origins. In my opinion, the set is an absolute slam-dunk for Standard, but as far as options for Modern go it’s pretty underwhelming. This isn’t relatively bad, as recently the flashy Modern plants have been a little too powerful (Deathrite Shaman, Treasure Cruise), but it does make for some quiet on the homefront as we are evaluating the new cards. A few different archetypes gained some options; Harbinger of the Tides for Merfolk/Blue Control and Jace for Control/Graveyard decks. Day’s Undoing and Abbot of Keral Keep are the cards I’m most excited to try out in Modern. Grixis Control! While Jeskai can offer the most “pure control” experience out of any deck in Modern, I’ve always find Jeskai to be lacking in a few areas that place it firmly in tier 2 in my mind. The ability to turn the corner, play a relatively low land count, maximize mana efficiency and answer threat-for-threat all combine to make Grixis Control a fun, challenging strategy for control lovers in Modern. As for unbannings, I would like to see Ancestral Visions unbanned, but that’s coming from my strong control-bias. It’s not clear that the card is too powerful, and could serve to push blue control firmly into tier 1. It’s possible that Visions’ unbanning would help Twin more than any possible control strategy, as often Twin functions as the control deck in the format, so I definitely see the risks, but a truly powerful control deck would help to reign in the million different flavors of combo running rampant in Modern. I could also see giving Birthing Pod a second chance, with the popularity of Kolaghan’s Command as a form of maindeck artifact hate. I believe Pod would not be as powerful as it has been in the past, were it to return. I find it hard to imagine a scenario where I would rather have Languish vs. Damnation. Most of the time, the two will be interchangeable, except for when Damnation is better because Languish only hits x/4’s or less. Against Siege Rhino, Gurmag/Tasigur, creatures that regenerate, creatures pumped by modular, Tarmogoyf and Titans, I would rather have Damnation. I imagine that a deck full of x/5’s could use Languish as a one-sided wrath, but a careful opponent could always save a Lightning Bolt to finish off your creature after it has been shrunken. I imagine that Jace will be Modern playable, as mentioned above, and Liliana could see play in some sort of Mardu or G/B sacrifice deck, though Liliana of the Veil could easily go in either of those decks as well. White aggro strategies have never been very popular in Modern, due to the prevalence of Tarmogoyf and better options in other colors, so I don’t think Gideon will be very strong either. We’ll just have to wait and see! I do think this is possible and much of my testing for Pro Tour: Magic Origins has in fact been done on stream! Streaming is an incredible resource that to this point has been under-utilized for testing purposes in my opinion. There are downsides to this as all information discussed is public, making it difficult to “hoard tech”, but the positives greatly outweigh the negatives in my opinion. Sharing information with viewers, gaining multiple perspectives on every issue, just working and learning together has made me a much better player, and I owe it all to streaming and to my viewers. Here’s to hoping that more people embrace streaming and testing on stream in the future! This of course depends entirely on the type of sandwich being consumed. Peanut butter and jelly works best with sourdough or mountain bread, while any type of cold cut sandwich pairs excellently with any sort of cheese/seasoned bread. Asiago cheddar earns bonus points for being literal candy! While not technically sandwiches, focaccia and goat cheese is delicious, especially with crumbled bacon! Thanks to all the readers/viewers that contributed questions, and thanks to you for reading! Pro Tour Vancouver is nigh upon us, and once I return victorious we can get back to Modern! Perhaps with a new deck or two? Let me know your thoughts/opinions on my thoughts/opinions, and if you missed the first go-round and have a question you’d like to shoot my way, feel free to ask in the comments! As always, everyone is welcome to stop by my stream any time and say whats up! Twitch.tv/Architect_Gaming. See you there! Good read. Found this website via the author’s twitch stream. Thanks for taking the time. I think I’ll take your Goblins deck out for a spin and see how it does. I have been playing around with Shared Animosity as a “end the game” type of card, but just having more 1-drops might be better. There are a bunch of different ways to build Goblins! I don’t know which one is “right” but all of them are fun and powerful! Good luck! You presented some pretty controversial opinions there. Personally, I believe that sourdough is best for cold cut sandwiches, and does not fit in well with the PBnJ style of sandwich. Also, why would focaccia and goat cheese not be considered a sandwich? My definition of sandwich does not include open-faced conconctions like bread and cheese or topped bruschetta. I could be way off base though! Well, according to Dictionary.com, a single slice of bread with toppings is known as an “open sandwich”, which does indeed include the word sandwich. I would probably categorize it as a sandwich variant. I don’t think Piledriver is good enough to make Goblins a deck in Modern. I played Goblins in legacy for quite a while, it was generally not very good excepting for putting a fast clock on combo. Warchief, Matron, or Ringleader would be far more likely to make the deck viable. I agree with Evan Scott Golden. There will be ofc hype at the beginning, for sure in LGSs someone will try to build any kind of Goblin deck … but without Lackey/Matron/Ringleader/Warchief it will be WAY to hard to pull it off. actually something that makes piledriver good is the fact it gives goblins a way to crash through t2 wall/goyf/tasigur. T1 dude, t2 piledriver, t3 bushwhacker is a 6/2 piledriver. Sure they can block the 1 drop – then your 2 drop has already dealt 6 which in an aggro deck is pretty darn good. What makes him weak, at least in the “go wide then burn” versions of goblins is he’s like the only legitimate bolt/decay/terminate target in the deck and that’s usually his fate. I suspect where he’ll shine most is in vial goblins with warren instigator, where you drop chieftans and rabblemasters and instigators into play and presumably the opponent can’t bolt everything. I’m going to say that you should be using bananas instead of jelly, and honey oat bread instead of sourdough, otherwise I agree with the rest of the article.